Connecting Deputy to your Talech account allows you to sync timesheets, sales data, and employees between the two systems. This guide will walk you through our Talech sync integration. This includes employee syncing, the ability to feed sales data into Deputy, and timesheet syncing. Please ensure that you have a valid Talech account before continuing. Now log into your Deputy account and click 'Edit Settings' on the Location you would like to connect to. 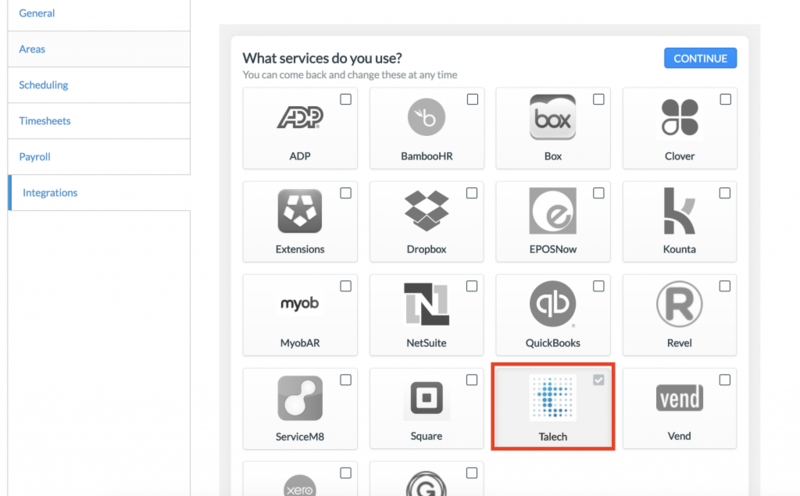 Scroll down to the 'Integrations' tab and ensure 'Talech' is selected, as seen below. Click 'Continue'. Now scroll down the list until you see the following. Click 'Authorize' to continue. A pop-up window will appear. Enter the email address and password associated with your Talech account. On the next screen, click 'Yes' to confirm the connection. After you have done this, you will see the three new Talech function buttons switch from 'Authorize' to 'Activate'. To add an employee in Talech, simply click the 'Settings' button and your list of employees should appear. Click the + icon in the top-right to add an employee. Now enter your employee details and click the blue 'Save' icon. This will save your employee. If you have the New Employee > Add Employee service switched on, this employee will appear within Deputy. In the above example, Jim McMahon was created in Talech. In the below screenshot, the same employee was created and invited to the Deputy installation. This service works much like our other POS sales sync. Connecting your account to Deputy will allow you to pull sales data from your Talech installation on your tablet, and use that data for reporting and accurately costed scheduling in Deputy. Please note that this will not pull/sync sales data in real-time. Sales data will sync every 15 minutes. 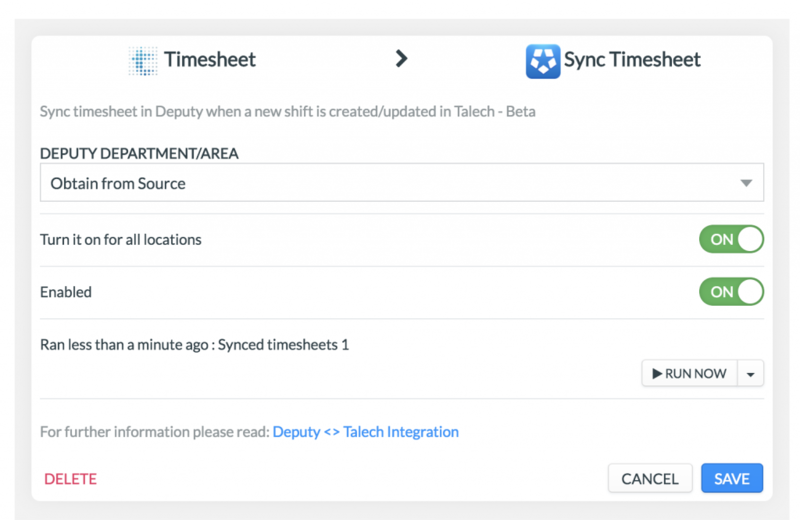 Talech can now send timesheet information to Deputy, allowing you export these timesheets for payroll. To do this, simply enter your PIN in the Talech iPad app and tap 'Clock-In', as seen in the screenshot below. 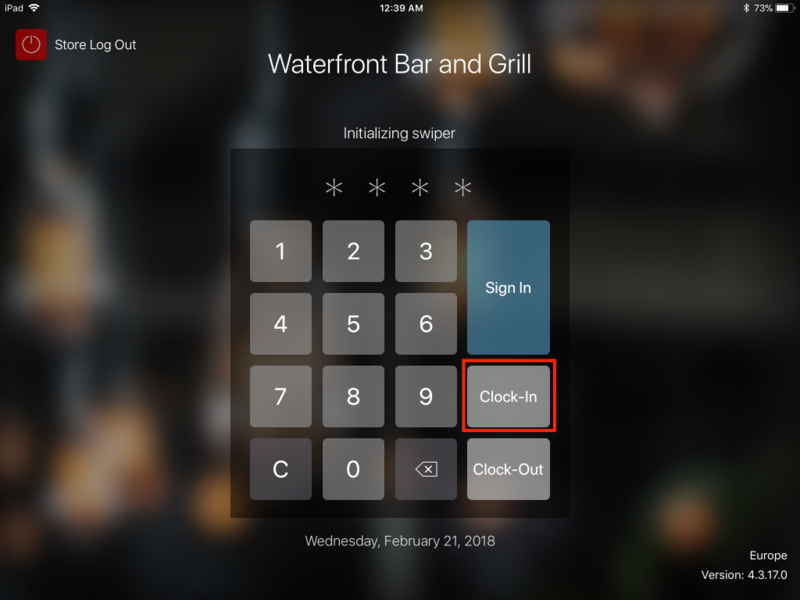 When your shift is complete, simply enter your PIN again, and tap 'Clock-Out'. These timesheets will be sent to Deputy every 15 minutes. The below image is an example of a synchronised timesheet from Talech. 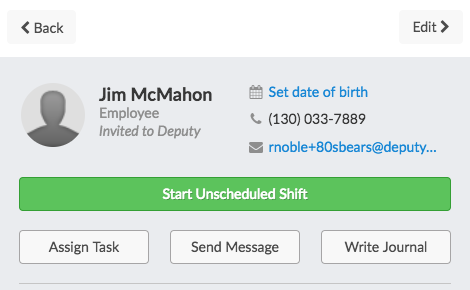 The comment as seen in the screenshot is a result of the integration, just as a clarification to users as to where the timesheet may have originated from.